Clock collecting is a hobby of many antique lovers, and some prefer to acquire pieces made by one specific company or that are one specific style. Seth Thomas Mantel clocks are one brand of antique clock highly sought by many collectors. Seth Thomas produced mantel clocks in the United States between 1817 and his death in 1859. The Seth Thomas Clock Company continued producing clocks until 2009, when the company was sold. The most famous Seth Thomas mantel clocks include adamantine, a type of veneer that resembles wood, onyx or marble, depending on its coloring. The clocks are often decorated with brass, and many have rows of pillars that appear on either side of the clock's face. One of the reasons why Seth Thomas Clock Company mantel clocks were so popular during their time was that the clocks were inexpensive alternatives to the French mantel clocks that were in fashion in Europe but made of more expensive materials. Collectors enjoy these clocks as a landmark in American clock making--one of the first clocks that rivaled European designs. The bottoms of mantle clocks produced by the Seth Thomas Clock Company usually have a paper label in gold or brown that identifies the clock. On the back of the clock, a series of numbers followed by a letter designate the clock's model. In good condition, antique Seth Thomas mantel clocks typically sell for over $500. 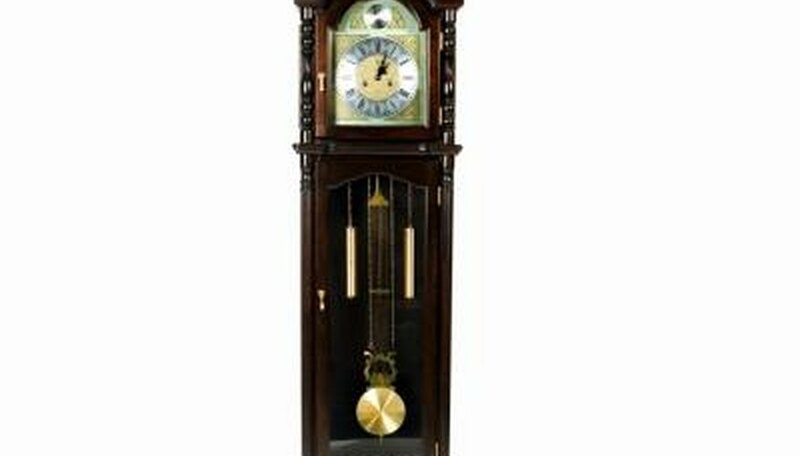 Modern replicas of the antique clocks sell for between $50 and $250.